April 6, 2011 - Cessna Aircraft Company, a Textron Inc. company, reported that it secured orders for 30 aircraft at the Sun ’n Fun International Fly-In & Expo that concluded Sunday in Lakeland, Florida. Sun 'n Fun is a "Fly-in" and airshow held annually at Lakeland Linder Regional Airport in Lakeland, Florida, usually during the second or third week of April. Participants in the fly-in include owners who fly their aircraft to the event from all parts of the United States and Canada. Many pilots fly their own vintage, homebuilt aircraft or restored ex-military aircraft. “The opening days of Sun ’n Fun were very positive, and while the storm on Thursday interrupted that mood somewhat, the exhibitors and the crowds bounced back to finish the show strong,” said Mark Paolucci, Cessna’s senior vice president of Sales and Marketing. 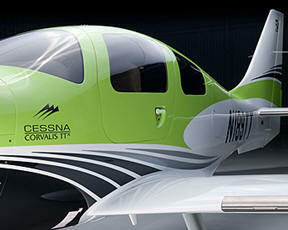 “Cessna took 16 orders for the new Corvalis TTX and 13 orders for high-wing single-engine pistons. Also, a Cessna Sales Team Authorized Representative took an order for a Grand Caravan.” Launched on the first day of Sun ’n Fun, the Corvalis TTX features new standard and optional equipment, all-new interior and paint scheme options, and the Intrinzic flight deck powered by the Garmin G2000. The G2000 is the first commercially available touch-screen-controlled glass flight deck ever designed for a piston aircraft offered to the general public. The debut of the TTX generated steady traffic to Cessna’s static display, where customers could see a mock-up of the newest generation of the world’s fastest commercially available fixed-gear single-engine piston aircraft. Included in the 30 orders secured at Sun ’n Fun are five new 172 Skyhawks for the University of North Dakota. The Skyhawks are scheduled for delivery in July and August. The order is part of a multi-year agreement between Cessna and UND’s John D. Odegard School of Aerospace Sciences to modernize its fleet of single-engine piston aircraft and will bring the training fleet to 63 Skyhawks, the largest single fleet of G1000-equipped Skyhawks in the U.S. UND began its acquisition of new Skyhawks in July 2008. Cessna is the world’s leading general aviation company. Since its inception in 1927, Cessna has designed, produced and delivered more than 192,500 airplanes around the globe. This includes more than 6,100 Citation business jets, making it the largest fleet of business jets in the world. Today, Cessna has two principal lines of business: aircraft sales and aftermarket services. Aircraft sales include Citation business jets, Caravan single-engine utility turboprops, single-engine piston aircraft and lift solutions by CitationAir. Aftermarket services include parts, maintenance, inspection and repair services. In 2010, Cessna delivered 535 aircraft, including 179 Citation business jets, and reported revenues of $2.6 billion.